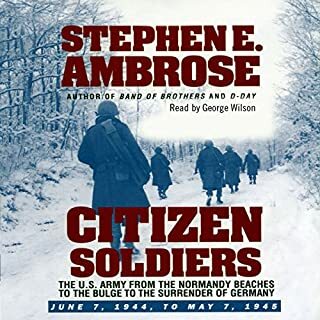 A masterful biography of the U.S. Army in the European Theater of Operations during World War II, Citizen Soldiers provides a compelling account of the extraordinary stories of ordinary men in their fight for democracy. From the high command on down to the enlisted men, Stephen E. Ambrose draws on hundreds of interviews and oral histories from men on both sides who were there. In the early morning hours of June 6, 1944, a small detachment of British airborne troops stormed the German defense forces and paved the way for the Allied invasion of Europe. Pegasus Bridge was the first engagement of D-day, the turning point of World War II. 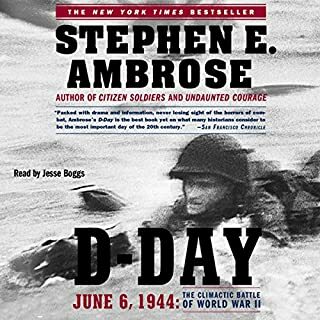 This gripping account of it by acclaimed author Stephen Ambrose brings to life a daring mission so crucial that, had it been unsuccessful, the entire Normandy invasion might have failed. 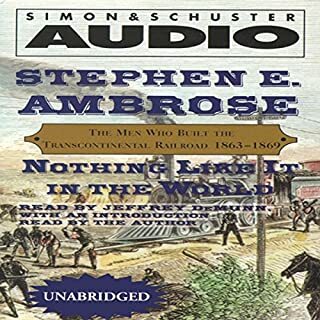 Nothing Like It in the World is the story of the men who built the transcontinental railroad. In Ambrose's hands, this enterprise comes to life. The U.S. government pitted two companies - the Union Pacific and the Central Pacific railroads - against each other in a race for funding, encouraging speed over caution. As its peak the work force approached the size of Civil War armies, with as many as 15,000 workers on each line. The surveyors, the men who picked the route, lived off buffalo, deer, and antelope. In this classic portrait of Dwight D. Eisenhower the soldier, best-selling historian Stephen E. Ambrose examines the Allied commander's leadership during World War II. 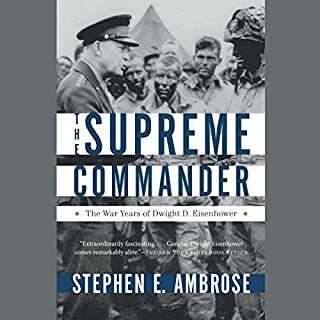 Ambrose brings Eisenhower's experience of the Second World War to life, showing in vivid detail how the general's skill as a diplomat and a military strategist contributed to Allied successes in North Africa and in Europe and established him as one of the greatest military leaders in the world. If you love military history... this. On the sparkling morning of June 25, 1876, 611 men of the US 7th Cavalry rode toward the banks of the Little Bighorn in the Montana Territory, where 3,000 Indians stood waiting for battle. The lives of two great warriors would soon be forever linked throughout history: Crazy Horse, leader of the Oglala Sioux, and General George Armstrong Custer. In this dramatic story of World War II, Jay A. Stout describes how the US built an air force of 2.3 million men after starting with 45,000 and defeated the world's best air force. In order to defeat Germany in World War II, the Allies needed to destroy the Third Reich's industry and invade its territory, but before they could effectively do either, they had to defeat the Luftwaffe, whose state-of-the-art aircraft and experienced pilots protected German industry and would batter any attempted invasion. This is the dramatic story of the American bomber boys in World War II who brought the war to Hitler’s doorstep. With the narrative power of fiction, this is a harrowing ride through the fire-filled skies over Berlin, Hanover, and Dresden. Fighting at twenty-five thousand feet in thin, freezing air no warriors had encountered before, bomber crews battled new kinds of assaults on body and mind. Air combat was deadly but intermittent: periods of inactivity and anxiety were followed by short bursts of fire and fear. On Thursday, October 14, 1943, 291 B-17 Flying Fortresses set out for a strategic bombing raid on the factories in Schweinfurt. Sixty of those planes never returned and 650 men were lost during the course of that mission. It was the greatest failure that the United States Air Force had ever suffered and became known as "Black Thursday". Martin Caidin's Black Thursday: The Story of the Schweinfurt Raid is a brilliant account of that day that should never be forgotten. This audiobook uncovers in thrilling detail the build-up to that fateful raid. The very young men who flew the B24s over Germany in World War II against terrible odds were an exemplary band of brothers. 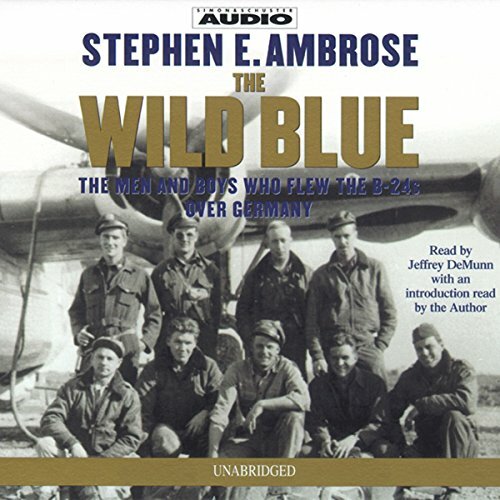 In The Wild Blue, Stephen Ambrose recounts their extraordinary brand of heroism, skill, daring, and comradeship. 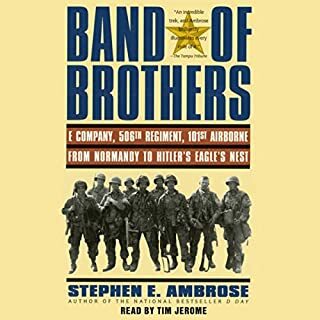 Ambrose describes how the Army Air Forces recruited, trained, and chose those few who would undertake the most demanding and dangerous jobs in the war. These are the boys - turned pilots, bombardiers, navigators, and gunners of the B24s - who suffered over 50 percent casualties. Ambrose carries us along in the crowded, uncomfortable, and dangerous B24s as their crews fought to the death through thick, black, deadly flak to reach their targets and destroy the German war machine or else went down in flames. Twenty-two-year-old George McGovern, who was to become a United States senator and a presidential candidate, flew 35 combat missions (all the Army would allow) and won the Distinguished Flying Cross. We meet him and his mates, his co-pilot killed in action, and crews of other planes - many of whom did not come back. As Band of Brothers and Citizen Soldiers portrayed the bravery and ultimate victory of the American soldier from Normandy on to Germany, The Wild Blue makes clear the contribution these young men of the Army Air Forces stationed in Italy made to the Allied victory. What did you love best about The Wild Blue? This made me appreciate what my father accomplished by becoming a pilot. He had not finished high school when he signed up. He doesn't talk about his experiences and I am hoping I will get him to tell me more about his experiences by gaining background information from this book. He was shot down on his 23rd mission and was to go home after 25. He set his bomber down in a field that turned out to be in Switzerland. His entire crew returned to the US and had reunions until a few years ago when most were too elderly to travel. Dad is 88 and still going strong. There were several moments in the book that moved me. Relating the stories of the many reasons why the men didn't get to return home. The extreme cold and discomfort the men had to live with while in the plane. The heart stopping stories of having to fly through flack. How young many of the pilots were. The empty bunks. As a political conservative I was somewhat concerned about the book's central figure, George McGovern and the direction the book might go. However, my brother-in-law was also a B24 pilot based in England during WW2 and since he, like most veterans, spoke little of their war experiences and I was curious to learn more about what they went through. I now think this book should be required reading in all high school history. Today we have no idea of what the "Greatest Generation" went through and gave so that we can enjoy the freedoms and blessings we take for granted today. One of the best books about war and air combat. Puts you right there in the pilot's seat on many bomb runs. I have to admit to being a little skeptical since the author claimed to be close friends with McGovern, the protagonist of the story and so there has to have been some needed objectivity lost. But the overall story isn't controversial by nature so I guess that's okay. If McGovern had made any serious blunders as a pilot or an officer, it would have surely come out before this book was ever written considering his political career. The story developed well and I liked the background on each character and getting a look at their training, etc. I admitted it, I’m an air plane nut (enthusiast) and a student of all things World War II. I’ve read much about the men on the ground; island hopping in a tropical hell hole and storming the beaches of Normandy. I wondered if there was a history that covered the strategic action in the air and that’s how I came across this book. 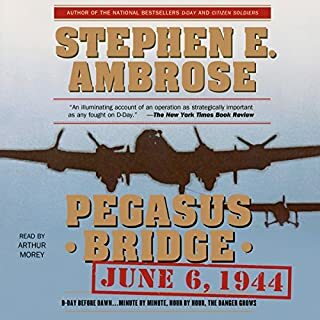 Ambrose did his usual thorough job in telling the story of the men flying missions out of Africa and Italy into the “soft underbelly of Europe”. He does with words what Ken Burns does with images; focus on individual stories of individual events in rich detail. George McGovern, US Senator, presidential candidate and anti-war activist is followed through training to fighting. His story is surprising considering his political stands of the 1970’s. He is heroic in the most understated way. His service is deserves our profound respect and gratitude. The B 24 comes alive as a fighting machine. It’s weight and lumbering maneuverability a constant challenge to their pilots. The Italian air bases and the communities they occupied are described very well. This gives needed comparison points to the bases of England that have been covered extensively. Planes are lost. Young men are killed. The horrors of war are written of in unvarnished accounts. The men, the mission, the planes and destruction are carefully and completely described. In the end the story is well told and the horror of aerial strategic warfare is fully displayed. Wars are sometimes unavoidable but they are always filled with human tragedies. If you ever wondered what it was to fly combat in the skies of Europe during the second world war, this is a good one. Godspeed, Mr. Ambrose; wish you were still around to write more. I have read several of Stephen Ambrose books and I would say this is the worst. There was no drama, I only listened on to hear some great tale. They flew they dropped their bombs and some returned, that sums it up. It was nice to hear about the Tuskeegee airman supplying bomber support, but all in all this was dry. Interesting tidbits, but not a gripping story. Would've liked more page-turning adventures, anecdotes, events. Essentially a recap of George McGovern's stint as a USAF bomber pilot.